Advanced Coasteering – the most extreme in Cornwall! For the most extreme coasteering experience book our Advanced Coasteer in Cornwall, it’s not for the faint-hearted. Possibly the biggest coasteering challenge in the county, the Advanced Coasteer is packed with adrenalin-fuelled action amongst normally inaccessible and extreme parts of the coastline around Cornwall. Who is the Advanced Coasteer for? 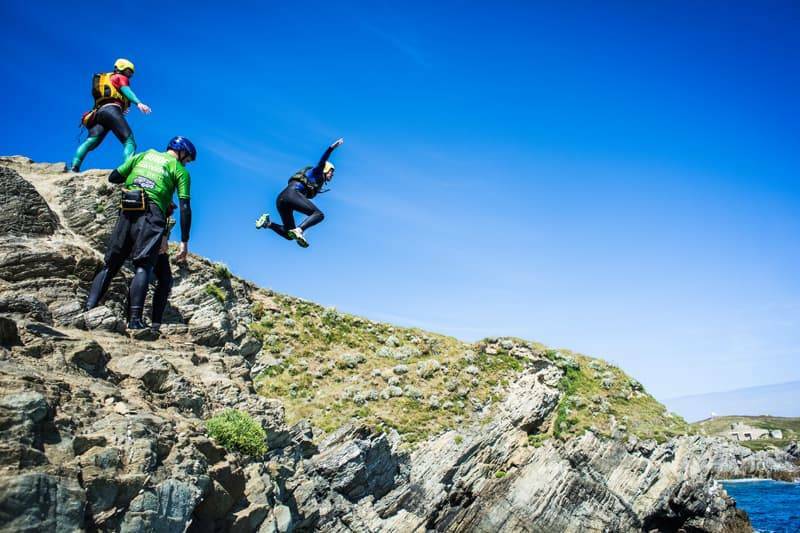 Previous coasteering experience is an absolute must-have for taking part in this challenge, with a minimum of two coasteers under your belt with Newquay Activity Centre. What is included along this coasteering route? At Porth Island to the east of Newquay town centre, our advanced route draws upon all your previous coasteering skills starting with a long sea swim across Porth Beach and a plunge into the heart of a coastline cave. You’ll climb through the ocean-forged cracks and crevices of Porth Island and climb into the face of blowholes to get blasted by sea spray. You’ll practice and develop wild swimming, how to jump into deep-water plunge pools in more testing environments, how to ride sluices (nature’s natural rapids) in challenging yet stunning arena. Arguably the best coasteering in Cornwall, it’s an awesome natural aquatic assault course. A relative secret spot and only for an able few, our Advanced Coasteer on Porth Island means we won’t see and/or get held up by other groups, we’ll have it all to ourselves. Capture the experience on our Advanced Coasteer! Why not bring a GoPro to capture one of the best coasteering routes in Cornwall, a panorama of this beautiful island and coastline and even some up close and personal selfies with the resident seal colony. No two coasteers on Porth Island are ever the same, be it the waves, wind, time of year or wildlife you encounter. Our reviews on Tripadvisor for Coastering at the NAC rank us as number one for Cornwall activities and we’re proud golden winners of the Cornish Tourism awards. Our Super SUP Coasteers are unique to Newquay activity Centre and will be an adventure to remember!